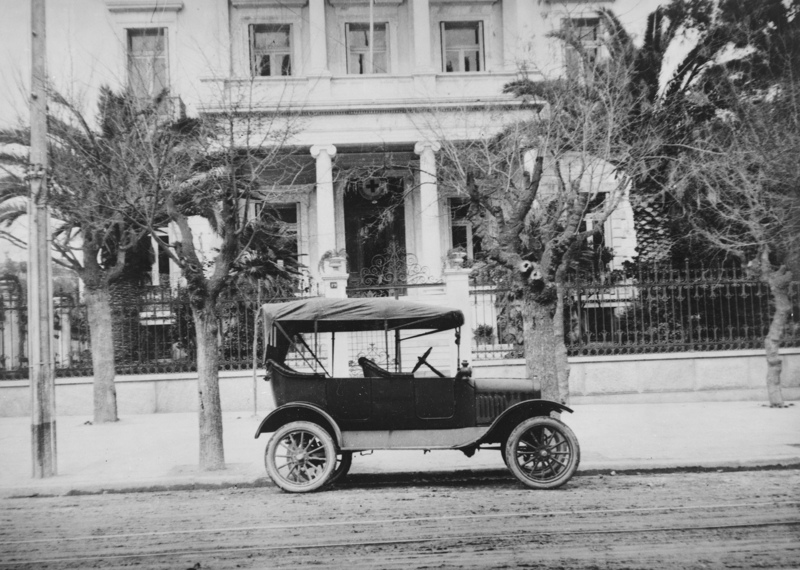 The headquarters of the American Red Cross in Athens, 1918-1920. Source: Horace S. Oakley Papers, Newberry Library, Chicago. This description of Athens was penned by A. Winsor Weld (1869-1956), one of the deputy commissioners of the American Red Cross Commission to Greece, a few days after his arrival in October 1918. Weld, an investment broker from Boston and a graduate of Harvard University (B.A. 1891), was one of a million Americans who responded to President Wilson’s call to provide military and civilian aid to many European countries at the end of WW I. The mission to Greece was organized in June and July of 1918 in response to an appeal from the Greek Red Cross (Capps 1919, 9). There came from America to do the work 103 persons (60 men and 43 women), and several others were recruited in Europe. 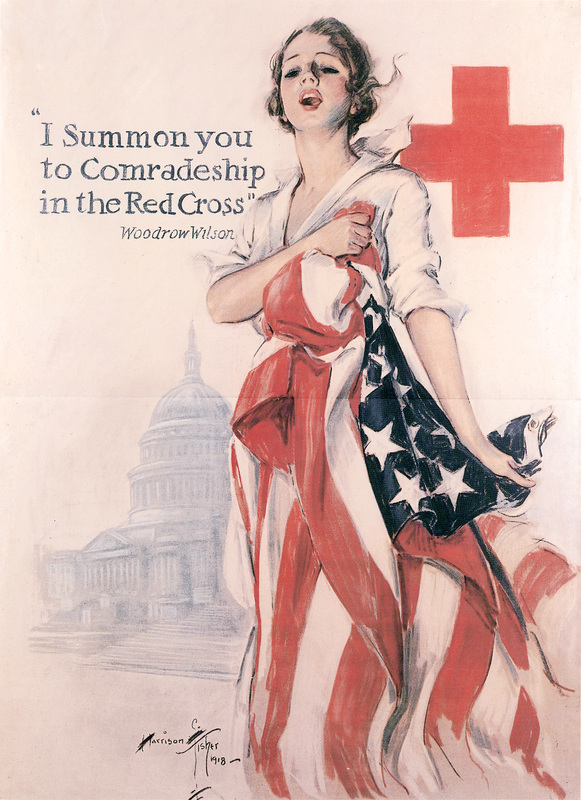 They enlisted in the service of the American Red Cross from all parts of the United States, and represented all manner of occupations and professions. There were business men, lawyers, bankers, physicians, preachers, teachers, farmers and mechanics, and among the women, trained nurses, stenographers and social workers. The authority of the Commission was vested in the Commissioner, who held the rank of Lieutenant-Colonel, and seven Deputy Commissioners with the rank of Major. 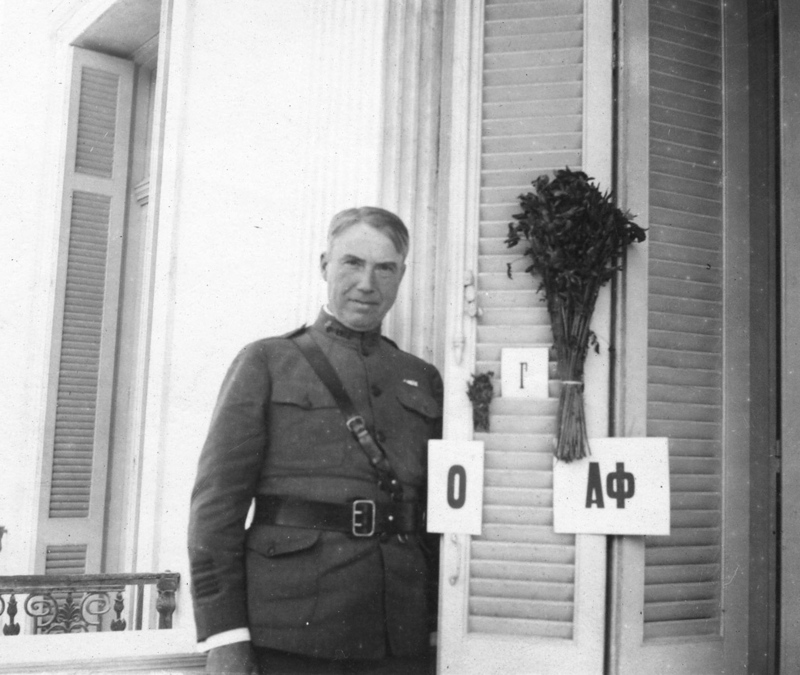 Lieutenant Colonel Edward Capps photographed on the balcony of the ARC headquarters in Athens, 1919. Source: ASCSA Archives. The Commissioner was Edward Capps (1866-1950), professor of Classics at Princeton University and newly appointed chair of the Managing Committee of the American School of Classical Studies (a position he held until 1939). Like Capps, most of the high-ranking officers of the Commission were mature men in their early 50s with families and established careers. For the younger staff personal development and career opportunities may have provided the motivation for joining the different missions of the American Red Cross (ARC hereafter) in Europe. It is less clear, however, why older, established figures would leave their homes and subject themselves to hardships and suffering. Several possibilities are given by Julia F. Irwin in her excellent study of American humanitarism from the late 19th century through WW II (Making the World Safe: The American Red Cross and a Nation’s Humanitarian Awakening, Oxford 2013). First and foremost, a strong sense of patriotic duty must have influenced their decisions. Although service in the ARC was not a substitute for combat, the militarization of the ARC after 1917 was viewed as an alternative form of service by many men who were beyond draft age. Businessmen, doctors, and professors, including Edward Capps, became majors and lieutenant colonels overnight. Furthermore, the cosmopolitan nature of American society during the Progressive Era encouraged international activities. But most of all, by being part of the ARC in the first two decades of the 20th century, one belonged to a new professional elite, “drawn from the ranks of the U.S. government and corporate America” (Irwin 2013, 7). These men and women were similarly minded and well-educated people who had embraced the scientific management theory for economic efficiency and labor productivity. They were an adventurous, but also proficient and ambitious lot. 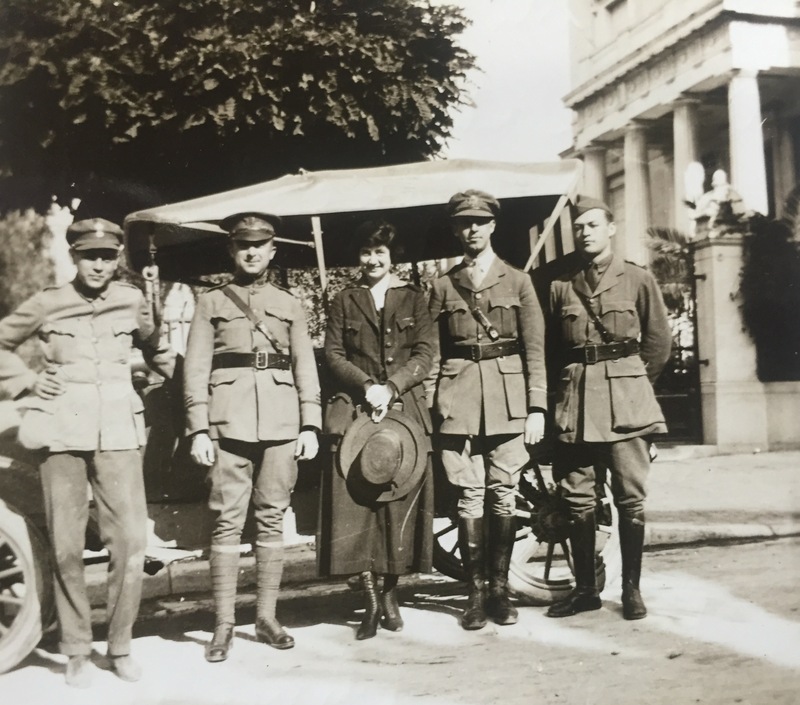 I became again interested in the work of the ARC in Greece in 1918-1919 when I was recently asked to contribute a paper about the humanitarian work of the American School of Classical Studies at Athens (ASCSA or the School hereafter) during the Great War. The conference, “The First World War in the Mediterranean and the role of Lemnos,” was held in June on Lemnos, and the participants were primarily historians. Because the relief efforts of Carl Blegen, Edwards Capps, and Bert Hodge Hill in eastern Macedonia had been the focus of a paper by Jack L. Davis at a conference at the American School of Classical Studies in 2011, I chose to concentrate on the Greek Commission’s work in the Aegean for this event (Davis 2013). Weld’s letters were important for other reasons as well. Since he was based in Athens, the letters provide valuable information about everyday life in the city, offering detailed descriptions of buildings, streets, and shops, and evocative accounts of lunches, teas, dinners, and the social customs of the city’s upper class. Weld’s descriptions of life in Athens capture the city during a brief interlude of optimism between the end of the Great War and the Asia Minor disaster in 1922. 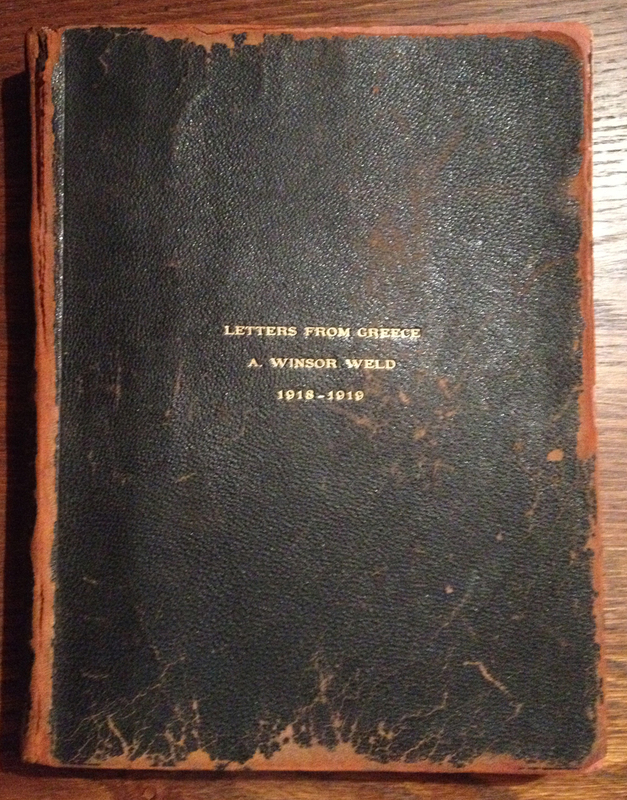 While profiling the deputy commissioners who had accompanied Capps to Greece, I was fortunate to find and purchase a rare, privately circulated volume reproducing letters that Winsor Weld had sent to his wife from Greece in 1918-1919. These letters, together with the published report that Weld produced about the activities of his mission on the islands of Lesvos, Samos, and Chios, were a valuable source of information for understanding the scope of the ARC’s work in the Aegean islands. 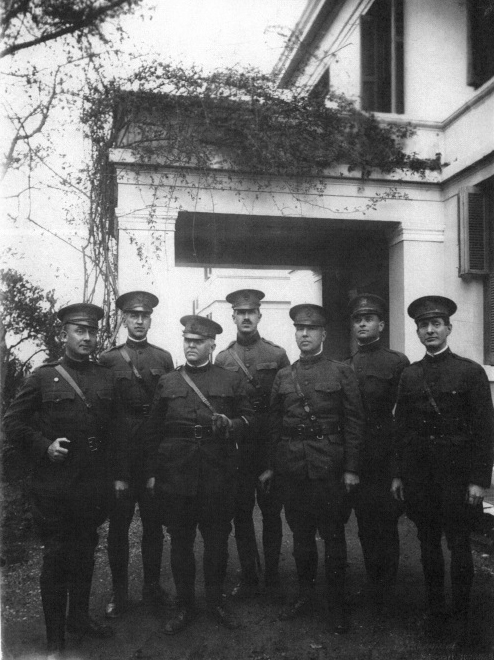 The ARC Commissioners photographed outside the American School of Classical Studies at Athens, 1919. Weld, second from left, Capps third from right. Source: Chicago History Museum. The part of the town near the School is not very attractive, the streets narrow and poorly kept up, but shortly you get down to the better part where there are really fine streets and avenues, broad and usually shaded with the pepper tree which grows in an umbrella shade about twenty five feet high… There are some fine dwellings, many of marble with columns, and almost all with gardens of tropical growth. In the shopping district it would not be hard to imagine yourself in Paris. The shops are not so fine of course but the streets are busy and there are a lot of cafes with tables on the sidewalk. It is in every way a much more attractive city than Rome” Weld concluded in one of his first letters to his wife (letter of October 26, 1918). 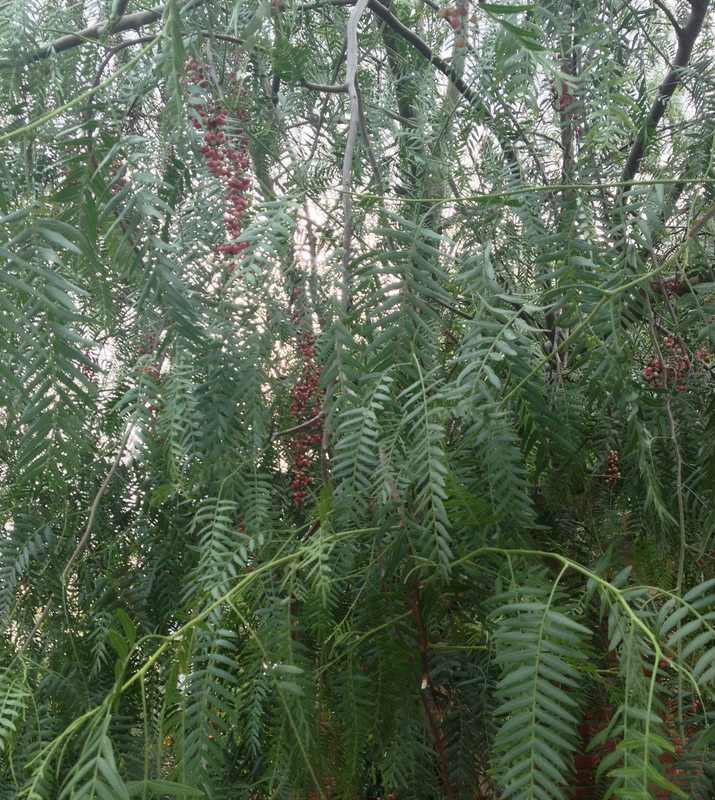 A pepper tree in Neo Psychiko. Look for the pepper seeds! 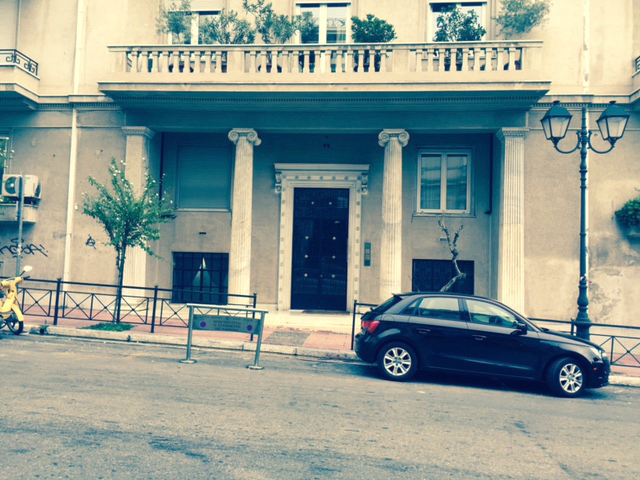 For its headquarters the ARC rented one of the empty neo-classical mansions on Kephissias Street (part of the street was re-named Vasilissis Sophias in 1932). The exile of King Costantine and a large part of the royal family in 1917 had created a number of vacancies in the center of Athens. The front side of the “Ypsilanti House” faced the Royal Gardens and a large corner apartment building, known as the Pesmazoglou Building, designed by Ernest Ziller at the turn of the century (and partly demolished in the 1960s). From the south windows the tenants of the house had a clear view of the Benaki mansion. The entrance to the Ypsilanti house was an impressive marble staircase that led to a porch with four Ionic columns. The same porch was repeated on the second floor. Photos of the house are preserved in the Library of Congress and in the personal papers of Horace S. Oakley at the Newberry Library in Chicago. Oakley, a lawyer from Chicago, was one of the seven deputy commissioners of the ARC Greek Commission. This elegant mansion was one of the first to go in 1939, in the spirit of modernization that overwhelmed Greece from the 1930s onwards. With the exception of its monumental entrance, there is nothing distinct or memorable in the architecture of the multi-story apartment building that replaced the “Ypsilanti house.” Architect Kostas Sgoutas relocated the entrance of the building from Kephissias to Koumbari Street, adorning it with two of the Ionic columns from its neo-classical predecessor. Why did he change the location of the entrance? Because Koumbari was no longer an inconspicuous side-street, but now the road from which one entered the Benaki Museum. In 1930 Antonis Benakis (1873-1954), the rich art-collector from Alexandria had transformed his family’s mansion into one of Greece’s most prestigious museums. Weld’s descriptions of his lunches and dinners are not only entertaining but also highly informative about the city’s public and private dining habits. A tall, slim man, Weld worried that he was “not getting enough fats as we have no butter, cream or meat fats of any kind, the only fat is olive oil with which they do most of their cooking. Greek olive oil has a very distinctive taste different from that we use and I am getting to like it.” Although Nikos Tselementes was already cooking meals inspired by French cuisine in Athenian hotels, his widespread influence on the Greek kitchen did not start until the 1930s. 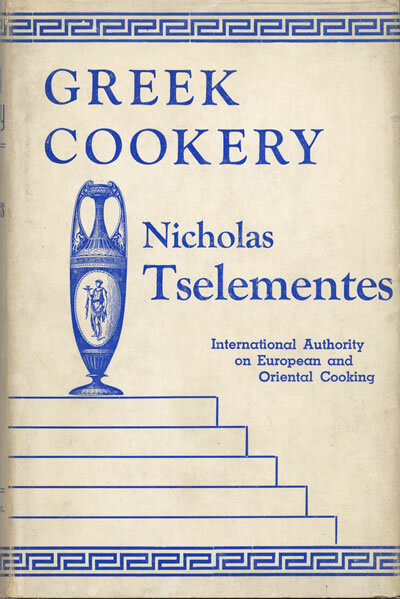 Moussakas and pastitsio, now considered signature Greek dishes, were actually the inventions of chef Tselementes, who introduced techniques using butter and milk, such as the rich béchamel sauce that covers both moussaka and pastitsio. Tselementes was extremely influential, and his books were standard gifts between women in the 1950s and 1960s. My mother gave me the two volume set when I left home to study at the University of Thessaloniki in the 1980’s. “Everyone spoke English perfectly and it was a very pleasant luncheon. I had feared there might be some Greek customs which we might not be on to, but not at all, the luncheon was served as it might have been at home. The usual dish of macaroni to begin with, then some very good mutton with potatoes and a green something like a coarse spinach with a dressing on it and peach compote for dessert. The meat and potatoes were the best we have had since we have been here” (letter of November 10, 1918). 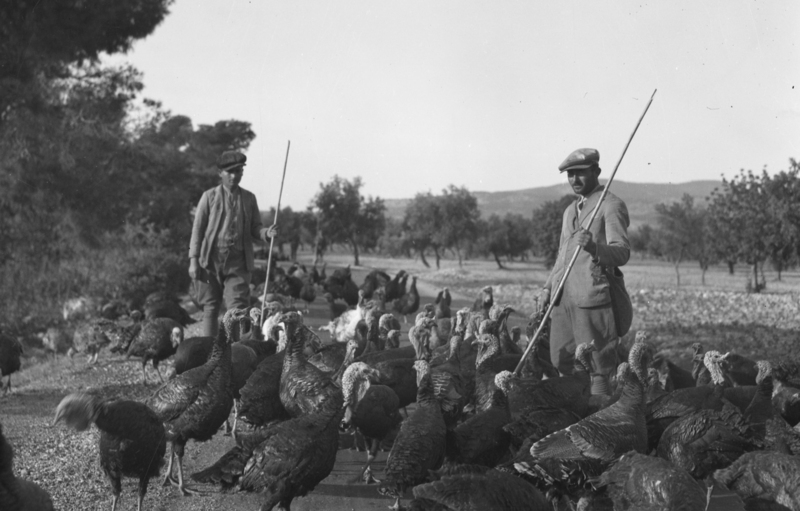 “I saw a curious sight yesterday, two men each with a long stick driving a flock of turkeys right through the city streets, there must have been nearly a hundred of them and they travelled along just like a flock of sheep, and were not at all disturbed by the carriages and people” (letter of November 14, 1918). I read his comments and wonder what happened to the Greek turkeys. Ι remember trying to find a turkey on Crete for Thanksgiving ten years ago. We had to try every butcher in Ierapetra before we found one who had a cousin (there is always a cousin!) raising turkeys! Although it is no longer difficult to find Greek or Italian turkeys for Christmas, getting one for Thanksgiving still requires some effort. We always have to order our bird a week ahead, so it has time to make the trip from Italy. The American Farm School also sells wonderful fresh turkeys in November but they are usually too small—3-4 kilos—for our party. While inspecting the island of Chios on behalf of the ARC, Weld made an interesting observation about the local mandarins. “We have mandarins after meals, picked off the trees back of the hotel, they pick them with a twig and a few leaves on each one so that you can tell if they are fresh by the leaves not being faded” (letter of December 16, 1918). I found his comment amusing because my husband has complained about the leafy mandarins on sale at the Friday market in Kolonaki. He stopped once he realized that the leaves were a mark of freshness! 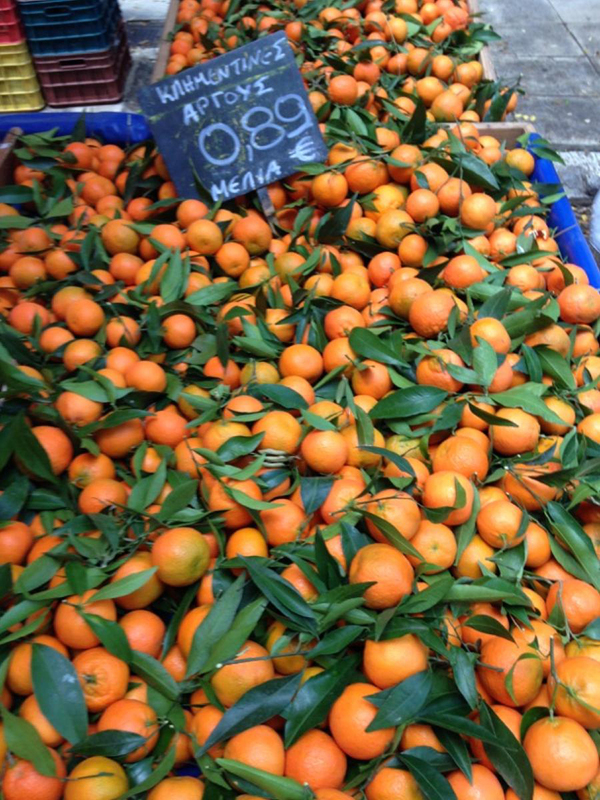 In fact last Friday, the mandarin seller told us that the Greek government wants to prohibit the sale of leafy mandarins—no doubt to promote mandarins that have been preserved in refrigerators and imported from one of Greece’s many lenders. On the evening of December 7, 1918, Weld, Capps and deputy commissioners Clifford Barnes, a protestant minister from Chicago, and Samuel Walker, a physician also from Chicago, were invited to dinner at the Deltas’, one of the city’s most prominent families. “We had a fine dinner: soup, fish or rice with a white sauce, spaghetti, chicken with potato chips, popovers, and three kinds of wine. The chicken was a great treat and the best meat we have had. Dinner was about eight-thirty and about eleven some forty people came in. We talked till twelve and were just catching each other’s eyes with the idea of going when the dining room door was flung open and we had tea, lemonade, and all kinds of sandwiches and cakes. Some party!” (letter of December 8, 1918). 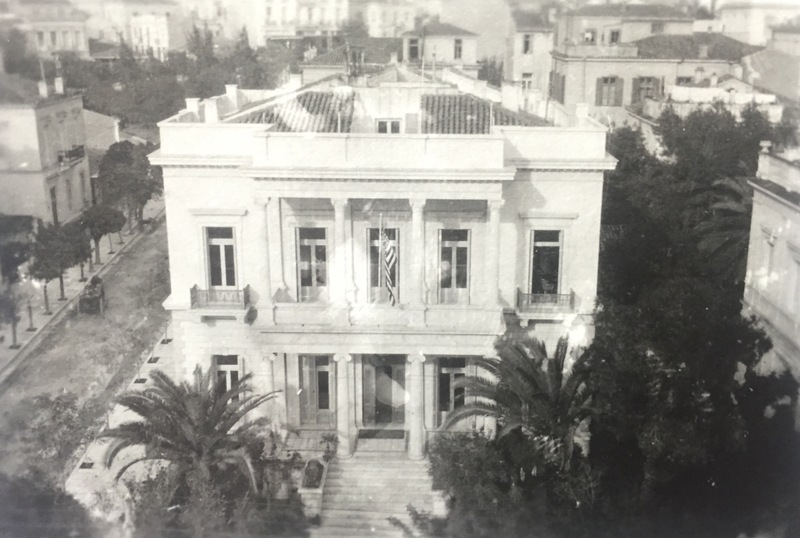 In late January 1919, he and other members of the ARC dined at the Diomedes mansion on 18 Regillis street (a building of the early 20th century by architect Anastasios Metaxas, modeled after the European “hôtels privés,” now the seat of the New Democracy party). “… a dinner of fourteen, and as usual a large number of people came in afterwards and at eleven a light supper was served” (letter of January 29, 1919). It must have been a sign of affluence for Athenian households to be able to entertain until very late at night, because electricity was limited to the main streets of the city and just a few private houses. Electricity was expensive and used sparingly by most households. Lights burning late in the evening must have conveyed messages of prosperity to all guests and passersby. On another occasion Weld was invited to tea after dinner. “Tea at quarter of ten in the evening is quite customary here” (letter of January 28, 1919). But was the story about King Alexander and Josephine Kelly real or just the creation of an ambitious journalist? “From the point of view, however, of cultivated Athenian opinion, the story is so utterly absurd as to refute itself, but, naturally, a great deal of malicious talk has been occasioned by it” Capps claimed in his letter. Alexandros Zaousis, the author of Αλέξανδρος και Ασπασία (Alexander and Aspasia), a biographical novel about the ill-fated king and his brief union with Aspasia Manou, also hints at Alexander’s flirtatious character. To him, however, most of the other romances were exaggerated by the King’s enemies, who fiercely opposed the idea of a morganatic marriage and were more than willing to sabotage Alexander’s relationship with Aspasia. 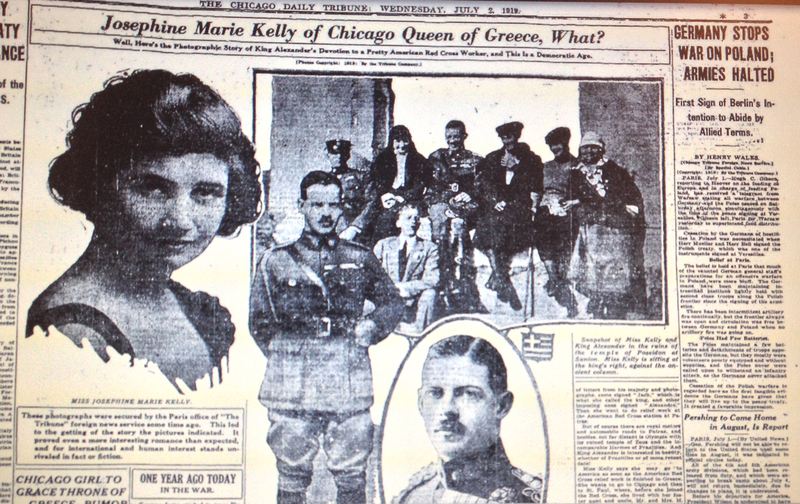 Interestingly enough, the photo of the King and Josephine Kelly in the Chicago Tribune in fact shows both women, Josephine and Aspasia, flanking the King. But it is also interesting that the photo was given to the press by Josephine Kelly, who claimed to have in her possession other photos and letters by the King, who occasionally signed as “Jack” for her! The next time that Josephine Kelly’s name was mentioned in American newspapers was a year later when King Alexander’s death was reported. “Was bitten by monkey” in The Cornell Daily Sun, 26 October 1920, also referred to his relationship to Kelly: “Indeed, it is said that he actually announced his engagement to her in Corinth the early part of 1919. Miss Kelly, however, who returned to this country a few months later, denied the report and subsequently was married to an American soldier.” The newspaper does not refer to Aspasia Manou, who had married King Alexander in a secret ceremony and was expecting his child at the time of his death. On July 29th, after nine months in Greece, Weld returned home. A lengthy report titled “Relief Work among the Aegean Islands” provides an official account of the humanitarian aid that he and other members of the Greece Commission organized and offered to thousands of refugees from Asia Minor. Greece and the American School of Classical Studies at Athens, however, had a lasting effect on Weld as well as the other members of the Greek Commission. Upon their return to America they would establish a Red Cross Excavation Fund to help the work of the School. Weld and Oakley would also serve as Trustees of the School (Weld also as a Treasurer from 1946 until his death in 1956). In 1926 Weld would return to Greece to attend the dedication of the Gennadius Library, and later to visit the Agora Excavations. Weld should perhaps be considered an “incidental philhellene,” one who first came to Greece for professional reasons, but who later developed a deep affection for the country (to borrow from Betsey Robinson’s description of another case of incidental philhellenism [Robinson 2013, p. 106]). Davis, J. L. 2013. “The American School of Classical Studies at Athens and the Politics of Volunteerism,” in Philhellenism, Philanthropy, or Political Convenience? American Archaeology in Greece, ed. J. L. Davis and N. Vogeikoff-Brogan, Hesperia (special issue) 81:1, Princeton, pp. 15-48. Robinson, B. A. 2013. “Hydraulic Euergetism: American Archaeology and Waterworks in Early-20th-Century Greece,” in Philhellenism, Philanthropy, or Political Convenience? American Archaeology in Greece, ed. J. L. Davis and N. Vogeikoff-Brogan, Hesperia (special issue) 81:1, Princeton, pp. 101-130.